African swine fever reaches northern Russia. FAO is concerned as pig disease jumps from southern Russia to the Baltic. FFollowing the first-ever detection of African swine fever (ASF)in Ukraine, the United Nations is warning that while control measures appear to have temporarily halted the disease's spread, it has established a firm foothold in the Caucasus and poses an ongoing risk to neighbouring areas. In addition to some other parts of Ukraine, nearby countries like Moldova, Kazakhstan and Latvia – which have large pig populations raised on household or family farms, and oftentimes weak bio-security protocols – are also now at high risk of the disease's introduction, according to FAO. ASF does not affect humans, but mortalities in domestic pigs can be extremely high. In 2011, up to 300,000 pigs died or were culled as a result of ASF outbreaks in the Russian Federation, incurring an estimated $240 million in economic losses. 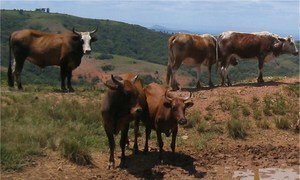 Collective action and solid commitments to a global strategy are necessary to control foot-and-mouth disease (FMD), the United Nations food agency stressed today.